Diablo and it's clones are games that have always been close to my heart. Dubbed either "dungeon crawler" or "hack 'n slash", if there's one thing I know that's important to a Diablo game is the loot. The pang of raw excitement you feel when a monster bursts with loot and you frantically scroll through the items to see if you see that tell-tale coloured hue of glorious rare loot. Which brings me to the latest installment, Diablo 3, the newest of the game that kickstarted a loot craze all across the world. As unrealistic as it might be I came up with a crazy challenge as soon as I heard the Real Money Auction House had opened up, allowing us to earn and spend real money in the world of Diablo 3. 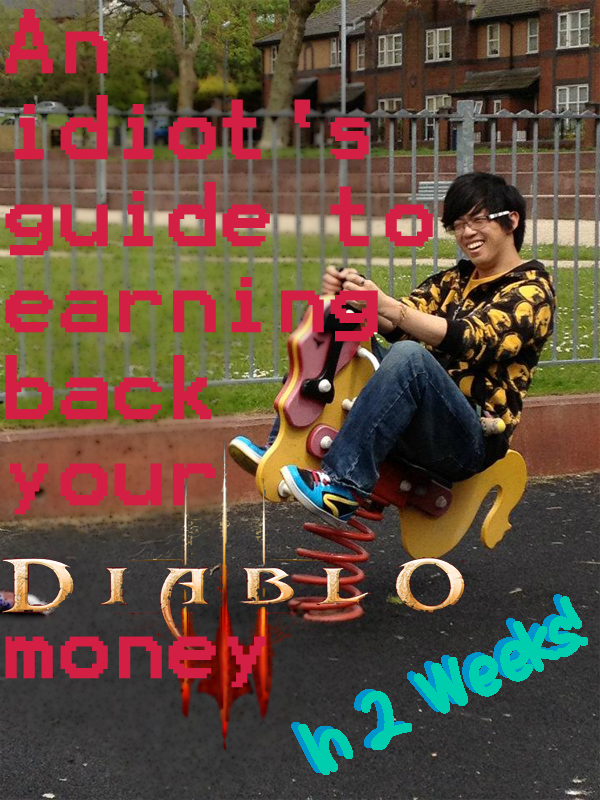 My proposed project is simple: play Diablo 3 for 2 weeks, chronicling my adventures as I go along, all with the sole purpose of utilising the Real Money Auction House to earn back the money I have lost in acquiring the game itself. The challenge itself brings about certain issues, firstly finding out what loot sells, identifying what the best price is for each item so that I guarantee myself a small increase in funds, finding the actual items themselves and, finally, the cuts that Blizzard will be taking out of my earnings. "I'm sorry, I'm afraid we're going to have to take a cut of your experience points..."
(Please note this is mainly for entertainment, yours and my own enjoyment, don't take it too seriously). Watch this space for the first day of Diablo 3 mayhem! Feel free to post strategies, words of wisdom, jeers, quips or helpful tips in the comments section. Pray for my poor hand which will soon be crying due to RSI.